Ganesha is worshipped by a lot of spiritually inclined persons; seeking spiritual advancement as the Omkar Swarupa. The procedure of worship is most simple. The Yantra given below is drawn on a white piece of paper with either Sindoor [red vermillion], Red Sandalwood. or even red colored ink. This Ganesh Omkar Yantra is worshipped daily. 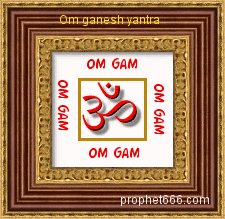 The Mantra which is recited is OM Gam. The Mantra has to be recited for a total of 100,000 recitation; there is no restriction on the number of days in which to complete this.